we used this balloon wreath on the front door to welcome guests at the boys birthday choo choo train party. it was simple to make and i know that it will be a fun, festive tradition to hang it on the door around celebrations for years and years to come. straw wreath (you pick the size in relation to your front door). remember that the bigger the wreath, the more balloons you will need. (note: do *not* take the plastic off the wreath or it will shed). floral greening u shaped pins you can find them in the floral section of your favorite local craft store (i got these at michael's). 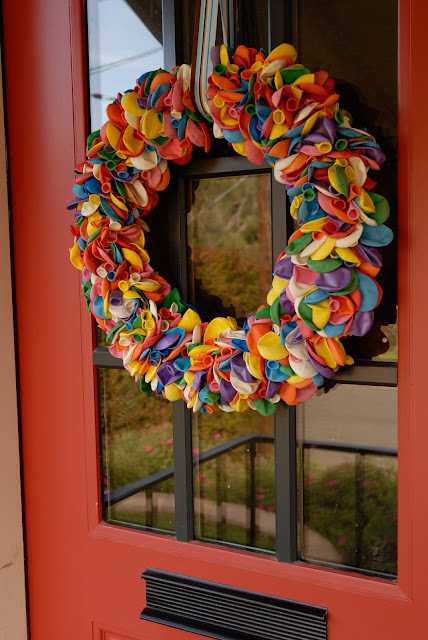 9" laytex balloons--i used around 12 packs of 25, but the amount that you use depends on the size of wreath that you use and how full you want the wreath to look. take balloons and pin them into the straw wreath. i pinned them two at a time. simply put the balloons in the middle of the u shaped pin and stick tightly into the straw wreath. make sure balloons are close together to avoid any gaps. line entire front, inside curve and outside rim of the wreath with balloons. this only takes a few hours (yes, hours. i know....not *crazy* fast....but not so bad either). i made mine while watching my favorite shows at night after the kiddos had gone to bed (and there my or may not have been a few glasses of red wine involved). it was fun, is simple, beautiful and will be around for years and years of celebrations to come. What an appropriate tutorial for your SITS Day! Adorable and since The Girl Child's birthday just passed, the next family birthday is MINE! I LOVE this idea! Such a cute birthday wreath! It's so nice to see you featured at SITS! thank you! we're thrilled you stopped by! Now that looks very cool and very easy! I love it. very easy...let us know if you make one of your own! Happy SITS day to you! I've always wanted to make a balloon wreath - you make it look totally easy! let us know how yours turns out! we'd love to hear how much money you saved at the dollar store too! LOVE IT! I have never seen this before...so creative and cute. Stopping by your blog from SITS. Enjoying it! Following you on Pinterst..yes addicted as well. You girls have great ideas! So cute! What a great idea. Happy SITS day! Looking forward to exploring your blog. thanks for stopping by. hope you love it here. I'm not the craftiest person in town, but I think I could do this! Happy SITS Day! I'm now following your blog and I'm following a few of your boards on Pinterest, too! you could totally do it! let us know how it turns out. welcome...hope you love it here! How adorable and festive! Gotta try this. Nothing says birthday like a bunch of balloons and these don't have to be blown up! I saw something similar done with mini drink umbrellas. So cute. oooh! drink umbrellas would be fun too. Consider this PINNED! Had to come back to tell you that I LOVE IT! Happy SITS Day, y'all! FB'ers RULE! Have fun with it. Celebrate, celebrate, dance to the music! Enjoy your big day, you two. thanks for pinning it! we love pinterest! LOVE IT!! Happy SITS day, make it a great one! thank you! so glad that you love the wreath! 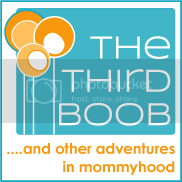 is there anything surprising about motherhood anymore? i'm more shocked with strange things don't happen! What a fun DIY! I think my son even though he's 14 would enjoy doing this DIY with me. BTW congratulations on your SITS day! You have a lovely blog. I'm following it! This is one of the coolest ideas ever!! I saw this on pinterest and thought it was a fabulous idea. go glad that you found us. welcome! What a cool idea! Love it. Happy SITS day! so happy to hear it! thank you! This is so fun and it would seem even the craftily challenged could do this! Thanks for the inspiration and "yes, even I can do this" reminder! Happy SITS Dsy! These are always so festive! Happy SITS Day! thank you! so glad that you stopped by! Happy SITS day! There's so much love, friendship and vibrancy in this blog! thank you so much! we are pretty happy you think so. welcome! What a fun birthday decoration! :) Happy SITS day ladies!!! Sorry I'm late. Life happened. we know well that life happens. we're just happy you stopped by. thank you!